Supported scaffold poles, legs, posts, frames, and uprights shall be plumb (i.e. 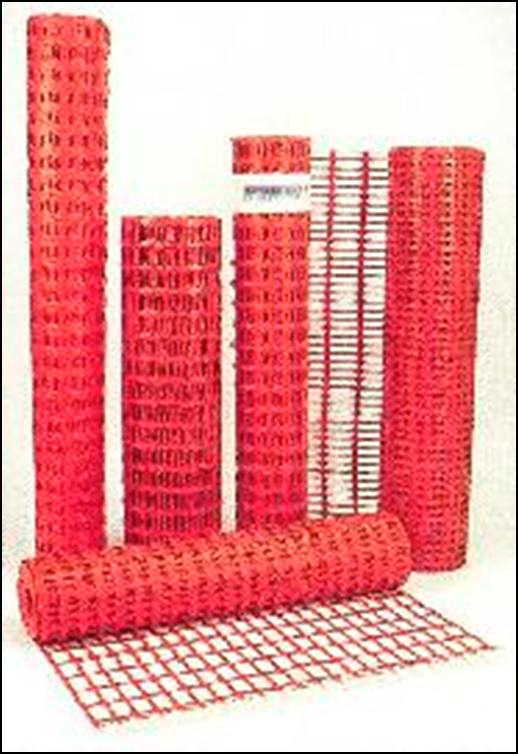 perfectly vertical) and braced to prevent swaying and displacement. 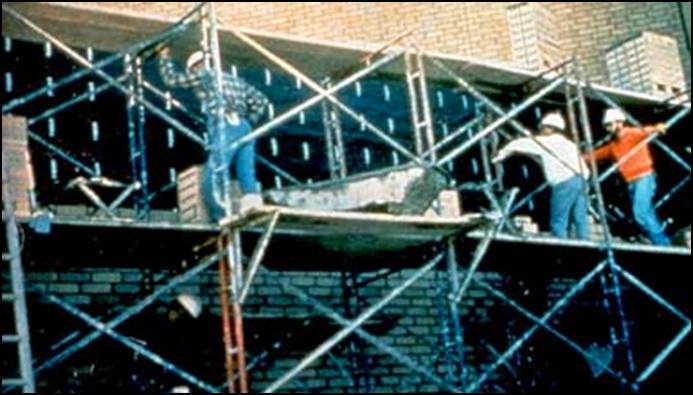 Crossbracing is required on both front and back sides of each scaffold buck or frame. To check a scaffold for being plumb, use a level on two opposite uprights. 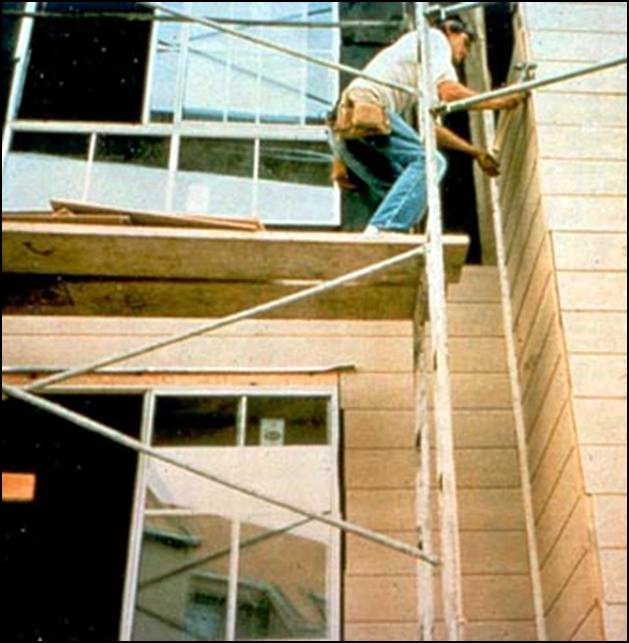 To make sure the scaffold is level, use a level on a horizontal support or bearer. To ensure the scaffold is "square", use a tape measure and measure the distance between opposite corners. The two measurements should be equal. For planks that are greater than 10 feet long, the maximum extension past the centerline of the support is 18 inches. 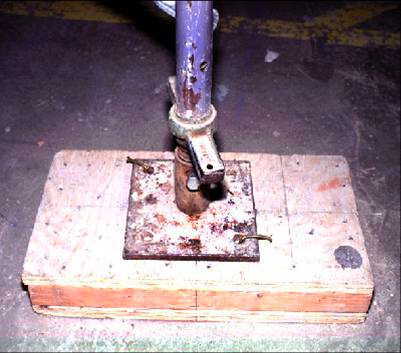 Where platforms overlap to create a running scaffold, the overlap must occur only over a support and shall not be less than 12 inches unless nailed together. 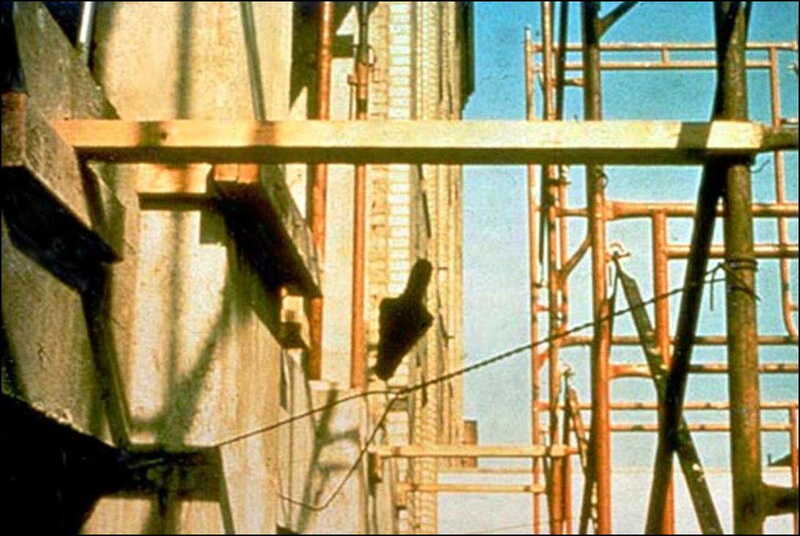 Ladders that are a part of the scaffolding system, such as hook-on and attachable ladders, shall be positioned so that the bottom rung is not more than 24 inches above the supporting level. Stairtowers must have hand and midrails on each side of the stairway. Stairs must be at least 18 inches wide and have a landing platform at least 18 inches long at each level. Stair treads must be of slip-resistant design. The riser height must be uniform, and the stair angle must be between 40 and 60 degrees from the horizontal. At Virginia Tech, a fall protection system (i.e. 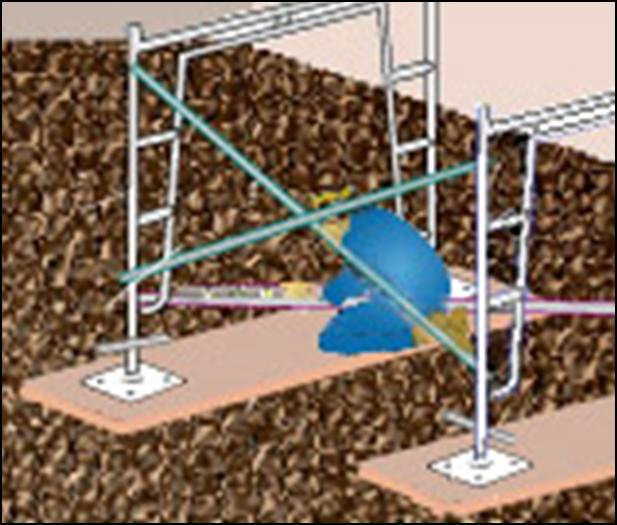 guardrail system) must be installed on on all scaffolds with a working height greater than four feet. The guardrail system shall be installed along all open sides and ends of the platform before being used as a work platform by employees. 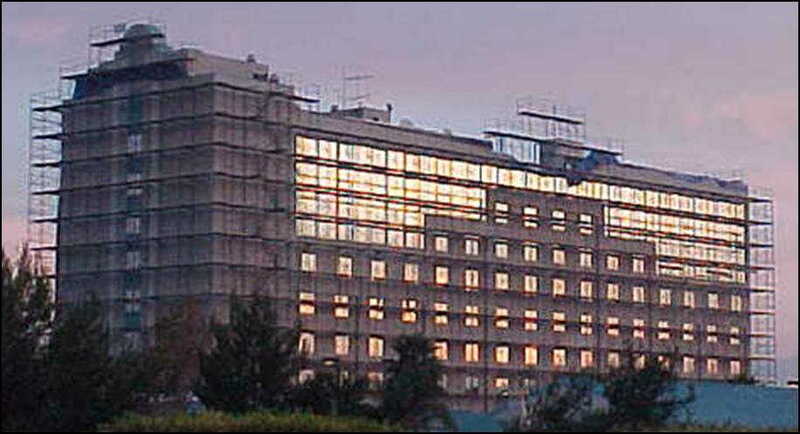 One exception is when the scaffold platform is within 14 inches of the face of the work. Top rails (manufactured after 1/1/2000) must be 38 - 45 inches above the platform surface. (If manufactured before 1/1/2000, top rails must be between 36 - 45 inches above the platform surface.) Top rails must be capable of supporting at least 200 pounds applied in a downward or outward direction. 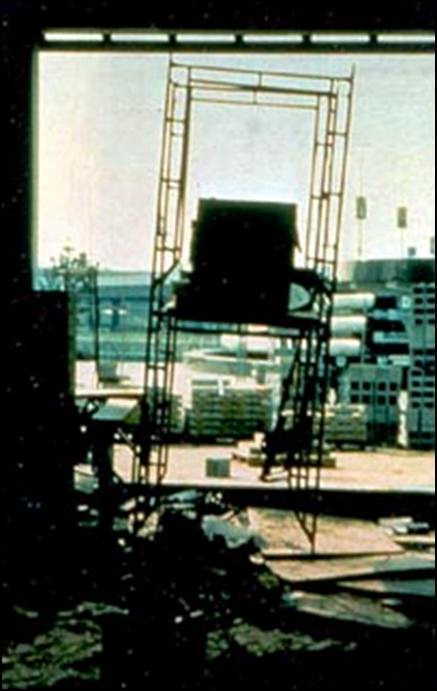 Note: Crossbracing is acceptable in place of a top rail when the crossing point of the two braces is between 38 - 48 inches above the work platform. It cannot serve as both a midrail and a top rail. Note: Crossbracing is acceptable in place of a midrail when the crossing point of the two braces is between 20 - 30 inches above the work platform. It cannot serve as both a midrail and a top rail (as incorrectly done in this picture). 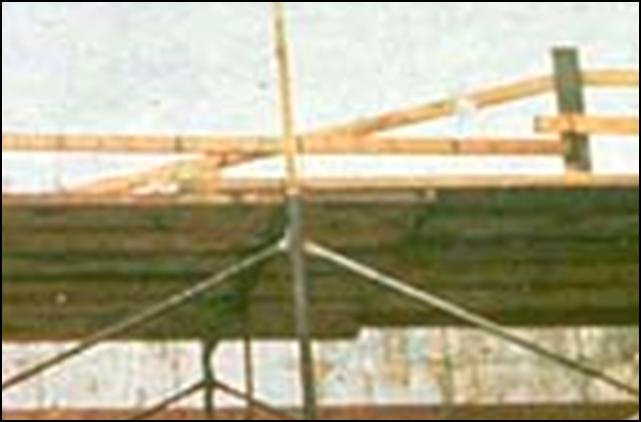 The scaffold competent person must determine personal fall protection requirements for employees performing erecting or dismantling activities, and for scaffold users if the scaffold is incomplete for any reason. Personal fall p rotection must be required and provided by the employer where the installation and use of such protection is feasible and does not create a greater hazard. 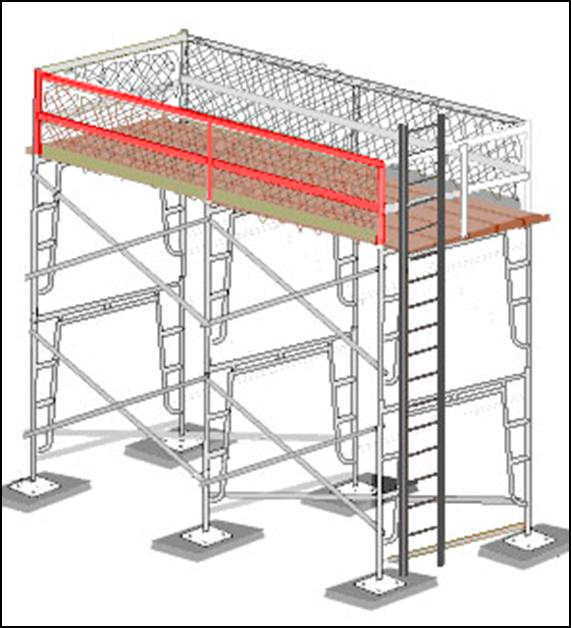 Large or heavy materials stored on the scaffold platofrm must be located away from the edges of the work platform and secured, if necessary. 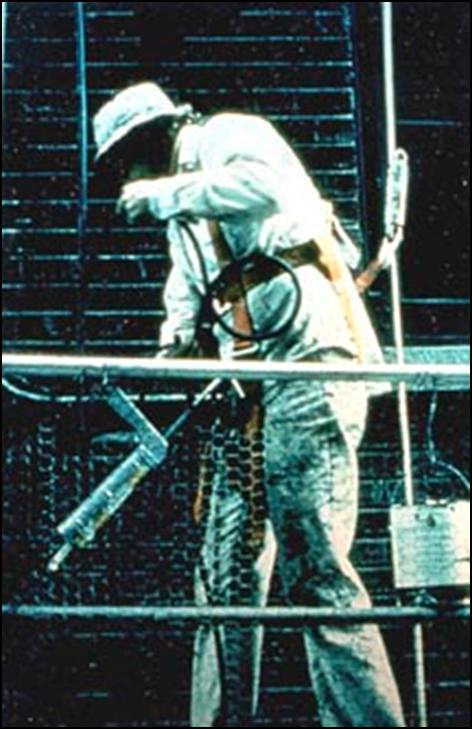 Personnel working on or from a scaffold, or in the vicinity of overhead work, such as that performed from a scaffold, aerial lift, roof, or crane must wear hard hats in accordance with Virginia Tech's Personal Protective Equipment Program.